Mickey Mouse and his friends have taken over Europe, to the delight of kids and families from around the world. When Disneyland Paris (first called Euro Disney) opened just outside of Paris in 1992, skeptics wondered how it could ever expect to attract visitors when all of Paris was available. 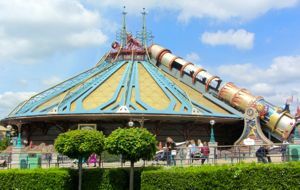 In recent years Disneyland Paris has welcomed 12 to 14 million visitors annually, making it the the most visited tourist destination in Europe. By way of comparison, the Eiffel Tower gets about 7 million visitors/year, the Louvre 7 to 10 million. Visitors come from all over Europe and from around the world, speaking a variety of languages and united by their desire to experience the magic kingdom of Disney. There are actually two adjacent theme parks, Disneyland Park and Walt Disney Studios Park. In addition, Disney Village provides shopping, cinemas, restaurants, and other entertainment. 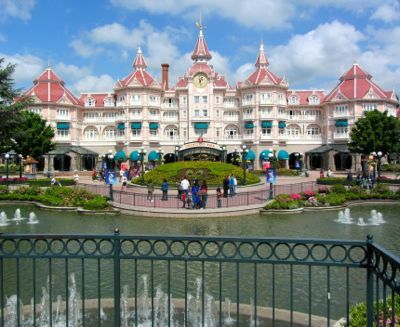 You can easily visit on a day trip from Paris, or you can stay overnight at one of the seven Disney hotels or other hotels in the area. If you really want to live it up, stay at the Disneyland Hotel, right at the park entrance. 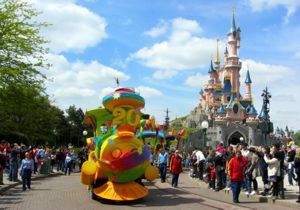 You have multiple options for transportation to the parks, including train, bus, car—even the Eurostar, just a two-hour and forty minute trip from London. There are lots of packages available—hotel plus admission tickets, Eurostar plus tickets, bus tours that include tickets, etc.—so you'll want to look at the options and choose what will work best for you. You can also buy individual tickets online through the Disney website, where you might get occasional deals. If shopping is your thing, you will have plenty of opportunities to buy Disney-themed souvenirs. The huge World of Disney store in Disney Village bills itself as "A Unique Shopping Experience," but there are shops galore throughout the parks. Hungry? No shortage of food options either. Restaurants and snack carts are everywhere too. Ready to go look for Mickey and Minnie? They're just waiting for you to arrive. Before you can enter the parks, you'll need to go through a brief security screening; I waited about 15 minutes the day I went, but your wait will depend on how busy the parks are when you go. Disneyland Paris is not actually in Paris, but rather in the new town of Marne-la-Vallée, about 38 kilometers (24 miles) east of Paris (map). It's easily accessible by the RER Ligne A, Eurostar, Ouigo and other trains, as well as by car. Above, A celebratory parade in Disneyland Park, and Sleeping Beauty's Castle. Below, Space Mountain: Mission 2, in Discoveryland, Disneyland Paris. 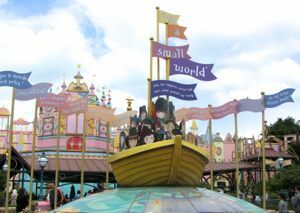 in Fantasyland at Disneyland Park, Paris.